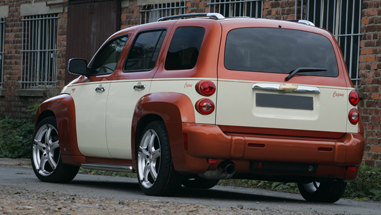 The Chevrolet HHR (for Heritage High Roof) is a retro-styled station wagon/SUV launched by the Chevrolet division of American automaker General Motors at the 2005 Los Angeles Auto Show as a 2006 model — and designed by Bryan Nesbitt. Smaller than the Equinox, the HHR shares the GM Delta platform with the Chevrolet Cobalt, Pontiac G5, Saturn Ion, and Saturn Astra. In Mexico, it was sold alongside its predecessor, the Opel-sourced Chevrolet Zafira compact MPV. The Chevrolet HHR is a compact four-door wagon that shares its front-wheel-drive architecture with the now-discontinued Chevrolet Cobalt. The optional 2.4-liter Ecotec is an aluminum four-cylinder engine, with 16 valves, electronic fuel injection and variable valve timing. 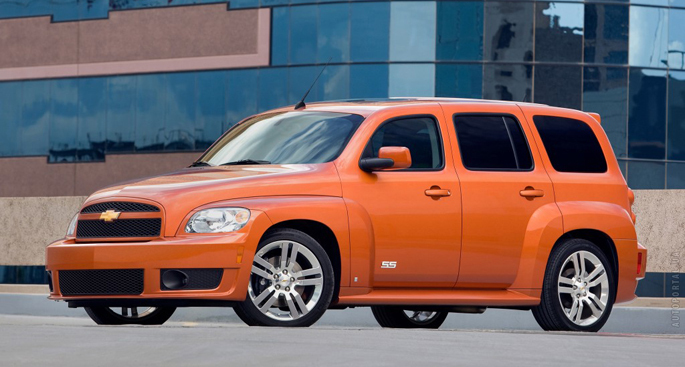 The 2.4-liter delivers 172 horsepower at 5800 rpm and 167 pound-feet of torque at 4500 rpm. The torque peak figure at such a high rpm suggests that the low-rpm pulling power might be weak, but quite to the contrary, it's not. Faced with a steep, slow hill, the HHR worked its way upward like a tractor, with no shifting-down or searching by the automatic transmission. This high-load, low-rpm driving is what many drivers demand, and the pulling power of the 2.4-liter engine is impressive. All the trims offer roughly the same EPA fuel economy ratings regardless of engine or transmission choice, the latter limited to five-speed manual or four-speed automatic units. The Chevy HHR is available only with front-wheel drive, while several competitors offer all-wheel drive for enhanced foul-weather capability. The 2LT has a sport-tuned suspension with 17-inch aluminum wheels. There is no harshness to the ride around town, or over freeway bumps for that matter. The HHR is nimble, though the suspension shows its limitations when driven like a sports car. The HHR SS features a 260-horsepower 2.0-liter turbocharged and intercooled Ecotec four-cylinder engine with either a five-speed manual or four-speed automatic transmission. The SS rides on performance tires, mounted on 18-inch polished alloy wheels, and the FE5 performance suspension was tuned on the famous Nurburgring track in Germany. The suspension includes specific stabilizer bars, spring rates and shock absorber tuning, all of which were designed to complement the turbocharged powertrain. ABS is standard on all models. 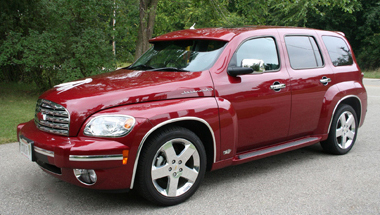 The vehicle's design is inspired by the mid-1940s Chevrolet cars and trucks, specifically the 1949 Chevrolet Suburban, with large, square fender flares and a hemispherical grille. The Chevy HHR Accessories have been credited to Bryan Nesbitt who was a designer. The HHR has a cargo-carrying capacity of 62.7 cubic feet. All models have a flat-load floor and fold-flat front passenger seat. For the 2007 model year, it is available in four trim levels; LS, LT, 2LT, and Special Edition. A panel van variant was also made available in 2007 for only the LT trim and became available on all trim levels in 2008. The HHR Panel has no side windows and cargo doors in place of conventional rear doors. The cargo doors open wide, enabling cargo access from both sides of the vehicle, as well as from the rear liftgate. The cargo doors are smooth and don't have external handles; they are opened via a dashboard release button or the remote keyless entry fob. The large, continuous area created by the windowless cargo doors and rear panels is ideal for business logos, advertising or personalization. The smooth, windowless sides on the Panel give it a cleaner, retro, more hot rod look than the standard models. The lack of windows adds security for contents inside.